Sterling silver, Turquoise, Lapis, Oyster Shell, White and Black Inlay. The inner bracelet circumference measures approximately 5-1/8", plus a 1-1/4" opening, and 7/8" at widest point. 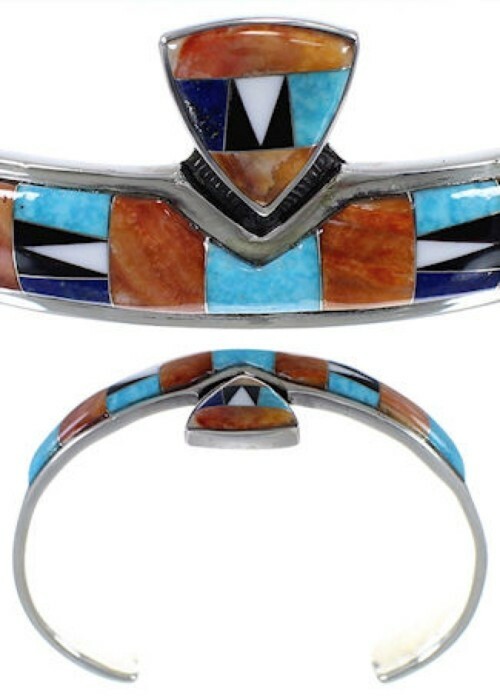 Take a look at this amazing cuff bracelet! The bracelet is hand made out of genuine sterling silver and Multicolor inlay. Real Lapis, Turquoise, Oyster Shell, White and Black Inlay are carefully set, while stunning a lovely design. The bracelet is stamped sterling and hallmarked.